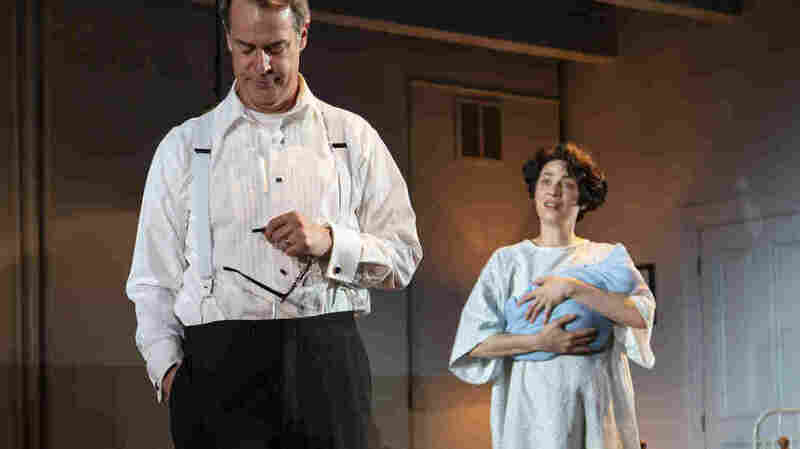 'Fall' Examines Playwright Arthur Miller's Secret Son The new play Fall tells the story of playwright Arthur Miller's son, Daniel, who was born with Down syndrome and was institutionalized as an infant. His parents never publicly acknowledged him. Actors Josh Stamberg (son of NPR's Susan Stamberg) and Joanne Kelly as Arthur Miller and Inge Morath in Fall. Playwright Arthur Miller was a giant of American theater and a champion of social justice. On stage, his iconic plays Death of a Salesman and All My Sons portrayed the American family with tight bonds and searing discord. Much of the tension he wrote about was between fathers and sons. As it turns out, Arthur Miller was wracked by family turmoil of his own: He had a son with Down syndrome, and he and his wife kept the boy's existence a secret. That story is now a play, called Fall, that's having its world premiere at Boston's Huntington Theatre. Fall begins in 1966; Arthur Miller is the toast of high society, he's married to photographer Inge Morath and they're living with their little girl in a rambling home in Connecticut when Morath gives birth to their son Daniel. 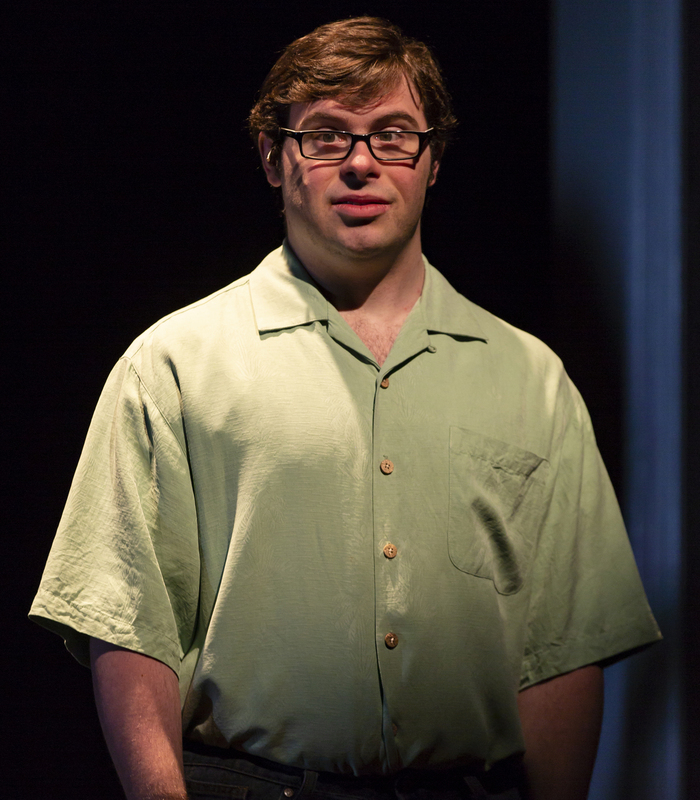 27-year-old Nolan James Tierce plays Daniel — and like Daniel, Tierce himself has Down syndrome. "My name is Daniel Miller," he says in the play. "Everyone calls me Danny. I'm a Yankees fan. I know every lyric to every Beatles song. I have Down syndrome." Miller never got to know those aspects of his son. In the play, a doctor advises Miller and Morath to put Daniel in an institution. At first, Morath cajoles her husband to ignore doctor's advice and raise their son at home — "He's your son and my son!" she implores him. But instead, they find an institution close to their home. In the play and in real life, Morath visited Daniel in the institution. Miller did not. (Years later, the institution — the Southbury Training School in central Connecticut — was cited for dangerous living conditions.) Vanity Fair magazine revealed the story of Arthur Miller's secret son in 2007; both Miller and Morath had died by then. You can't say their motives were evil or anything like that. They did what they felt they had to do. And to demonize him would diminish the play. Bernard Weinraub wrote Fall, and he says it was important to him to not demonize the couple. "You can't say their motives were evil or anything like that. They did what they felt they had to do. And to demonize him would diminish the play, because I think you have to understand and try to get to the complexity of motives and marriage and what happened between them." Weinraub based parts of the script on interviews he did with social workers at the institution. When he told Huntington Theatre Artistic Director Peter DuBois about the play, DuBois was enthusiastic. "I thought this is an incredibly important story to tell," he says. "This was someone who lectured us on right and wrong. And I felt this real deep passion about telling this story of human fallibility." But when DuBois tried to partner with other theaters on the production, there were no takers. "There have been a lot of people that have said, 'I don't want to be the one to be launching this narrative in the theater' — that, you know, Arthur is too respected a writer." As it happened, Arthur Miller never wrote another masterpiece after Daniel was born. Actor Nolan James Tierce plays Daniel Miller; he has Down syndrome just like the character. The real Daniel Miller is now 51 years old, thriving, and living with a foster family in Connecticut. Actor Nolan James Tierce has never met Daniel, but considers him an idol — in part for surviving in a now-notorious facility. And Tierce is well aware of that period in America, when it was common to house children with disabilities in institutions. "That history was, actually, at that time, barbaric. I feel so bad for those people who've been institutionalized for many years like Daniel," he says. And, he adds, he feels for Miller and Morath, "because of they didn't really get to know Daniel that well, except for Inge. She was there at the sidelines, and Arthur just completely shunned him out of his life ... It is their loss — and a tragedy." DuBois says he's proud to direct the world premiere of the play about Arthur Miller. "But I won't beat around the bush, I mean, I think this is about a hero who falls ... I think he took a huge fall in his life when he decided not to make Daniel a part of it ... I feel like he would have found something in his relationship with Daniel that I think would have affected his writing — in a good way." The playwright and his son did meet, when Daniel was grown. And when Miller died, he left Daniel and his three other children equal portions of his estate. This story was edited by Andrea de Leon, produced for radio by Andrea Hsu and Chad Campbell, and adapted for the Web by Petra Mayer.